Ubuntu 12.04 LTS Rackspace Cloud Server as VNC Remote Desktop can be virtually used as Desktop as a Service or Real Cloud OS. This time with full Guided Video. Basically we wrote the full guide before as Ubuntu with GUI on Rackspace Cloud Server as VNC Remote Desktop. 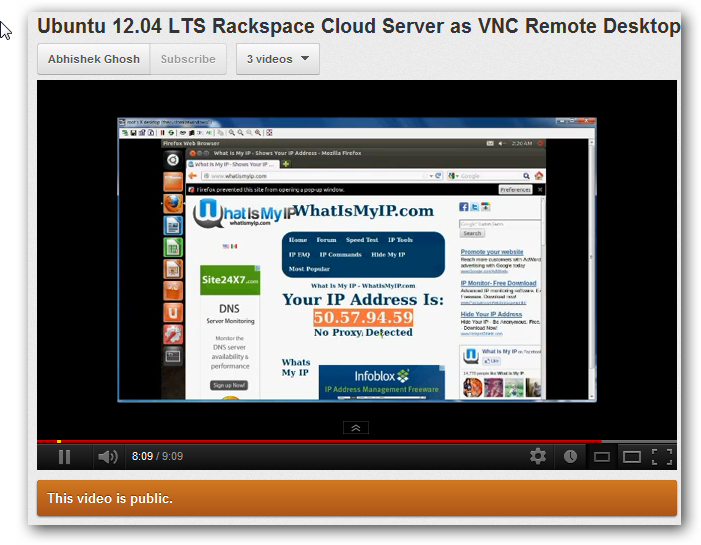 This time, the video journey has been named as Ubuntu 12.04 LTS Rackspace Cloud Server as VNC Remote Desktop. Some tips plus guru killer talks. Ubuntu 12.04 LTS Rackspace Cloud Server as VNC Remote Desktop is technically not Desktop as a Service, but definitely it is a remote desktop which can be used for any purpose, for any duration with full security (as far Public Cloud can offer). If you want a very secured environment, then you have to build a Private Cloud based on OpenStack either only using the Servers or by using your computer or data center as Bare Metal. From few cents per hour to few thousand dollars per month – all solution through this Ubuntu 12.04 LTS Rackspace Cloud Server as VNC Remote Desktop model. We use Private Cloud with data center with OpenSUSE for our academic quite serious purpose. VNC is itself quite secured and if you do not install any server software like configure it as Linux Apache MySQL PHP (LAMP ) server, configure the virtual host, practically it is quite difficult to hack. Moreover the SSH is protecting. The major vulnerable point is your Internet Connection, if shared or a Wifi one. For serious works, using a leased line would be the best. Notably, you can use a Windows Computer too with $5.00 per month extra charge too. You can search this website with VNC, WiFi, SSL, Desktop as a Service etc. terminologies, you will get the gross idea. You will notice at the last moment, I am opening this website after showing you that the IP is of the Server, not of my ISP. Carefully if you notice, the GUI is sluggish due to several factors – first it is encrypted twice, second the computer I used is a Windows Computer – on Mac OS X it becomes fast, so on Linux (due to the underlying technology), but this website loaded very fast. That paradox is due to the fact – our website is hosted on managed Rackspace Cloud and actually the webpage opened using Rackspace’s internal network (ServiceNet) not the public Internet as the request was from Rackspace Server to Rackspace Server through HTTP GET request. This Article Has Been Shared 2429 Times! Cite this article as: Abhishek Ghosh, "Ubuntu 12.04 LTS Rackspace Cloud Server as VNC Remote Desktop," in The Customize Windows, October 7, 2012, April 25, 2019, https://thecustomizewindows.com/2012/10/ubuntu-12-04-lts-rackspace-cloud-server-as-vnc-remote-desktop/.